We are happy to announce the release of CapLoader 1.7! 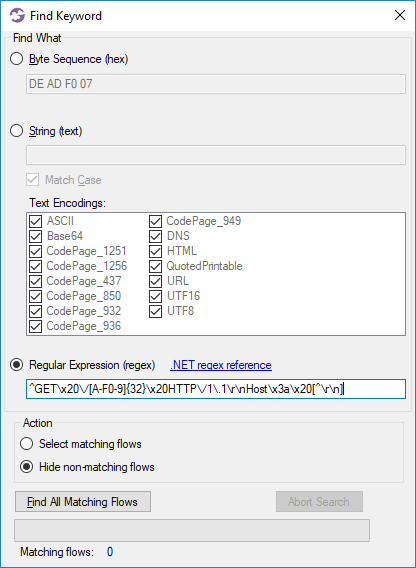 CapLoader’s “Find Keyword” window has been extended with an option to search flows using regular expressions (regex) as an alternative to searching for strings or byte sequences. 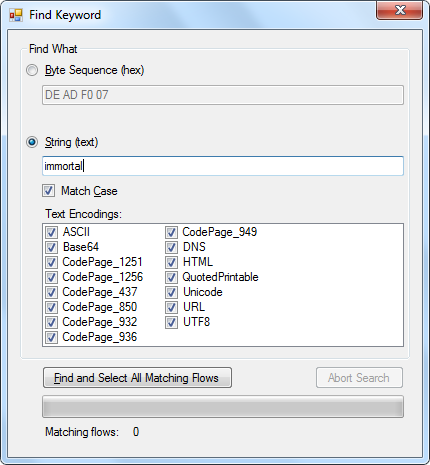 With help of the powerful regex syntax built into .NET this new search option enables very flexible searching. 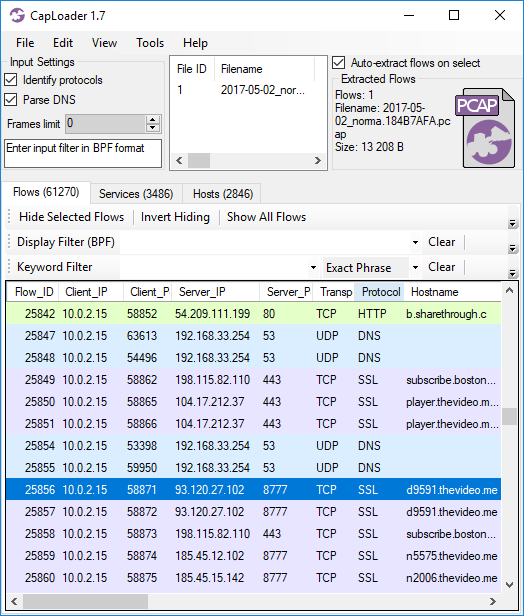 The Find Keyword window can be opened by clicking Edit > Find Keyword, or by pressing Ctrl+F after having loaded a PCAP file. You can learn more about regex searching with CapLoader in our short video called "Detecting the Pony Trojan with RegEx using CapLoader". We added support for querying online services for IPs and domain names to the latest release of NetworkMiner, now it’s time to add this very handy feature to CapLoader as well. Right-clicking a Flow, Service or Host in CapLoader brings up a context menu with links to various online resources that might have more details regarding the clicked IP address or domain name. APNIC Whois, Censys, Cymon, ExoneraTor, Google Public DNS, GreenSnow.co, Hurricane Electric, IBM X-Force, Internet Storm Center, mnemonic Passive DNS, PacketTotal, SecurityTrails, Shodan, ThreatCrowd, ThreatMiner, UrlQuery and VirusTotal. Cymon, Google Public DNS, Google Safe Browsing, Hybrid Analysis, IBM X-Force Exchange, mnemonic Passive DNS, MXToolBox, MyWOT, Norton Safe Web, PacketTotal, SecurityTrails, ThreatCrowd, ThreatMiner, URL Void, UrlQuery, VirusTotal, Website Informer, Webutation and Whoisology. The dynamic protocol detection (or Port Independent Protocol Detection, aka “PIPI”) in CapLoader has been improved to support even more protocols than before. We have also fine-tuned the protocol identification algorithm to be both faster and more accurate. ﻿Users who have previously purchased a license for CapLoader can download a free update to version 1.7 from our customer portal. All others can download a free 30 day trial from the CapLoader product page (no registration required). We’d like to thank Michael Nilsson for suggesting the IP and domain name lookup feature and Tohar Braun for suggesting RegEx search support. We’d also like to thank Ralf Alvarsson and Jarmo Lahtiranta for reporting bugs that have been resolved in this release. A new function in the free version of CapLoader 1.2 is the "Find Keyword" feature. This keyword search functionality makes it possible to seek large capture files for a string or byte pattern super fast! You might say, so what? 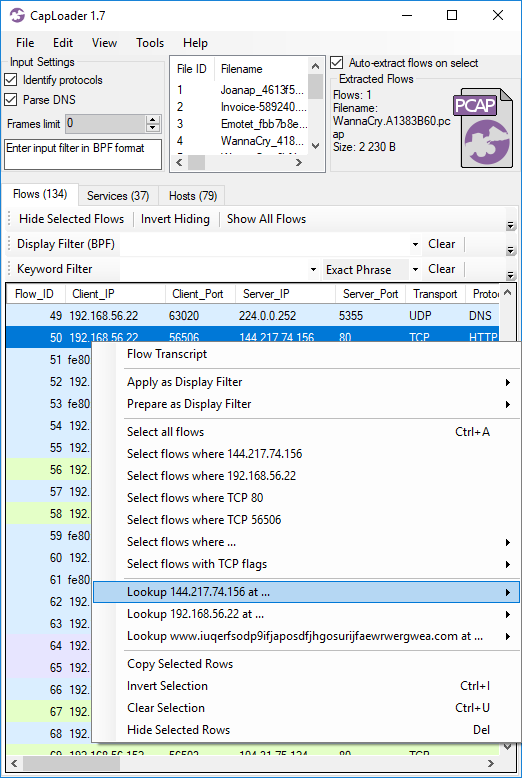 PCAP string search can already be done with tools like tcpflow, ngrep and even Wireshark; what's the benefit of adding yet another tool to this list? One benefit is that CapLoader doesn't just give you the packet or content that matched the keyword, it will instead extract the whole TCP or UDP flow that contained the match. CapLoader also supports many different encodings, which is demonstrated in this blog post. Track User-Agent - Search for a specific user agent string to extract all the HTTP traffic from a particular browser or malware. Track Domain Name - Search for a particular domain name to get all DNS lookups as well as web traffic relating to that domain (including HTTP "referer" field matches). Extract Messages - Search for a keyword in e-mail or chat traffic to get the whole e-mail or conversation, not just the single packet that matched. Extract Files - Search for a unique string or byte sequence in a file (such as a piece of malware) to enable extraction of the complete file transfer. 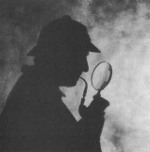 As an example, let's search the digital corpora file net-2009-12-06-11:59.pcap (149 MB) for the keyword "immortal". Follow these steps in order to veify our analysis using the free edition of CapLoader. Edit -> Find Keyword (or Ctrl+F), enter "immortal"
Right click the selected flow (ID 5469) and select "Flow Transcript"
Looks as if an email has been sent with an attachment named "microscope1.jpg". However, the string "immortal" cannot be seen anywhere in the transcript view. The match that CapLoader found was actually in the contents of the attachment, which has been base64 encoded in the SMTP transfer in accordance with RFC 2045 (MIME). Tools like ngrep, tcpflow and Wireshark won't find any match for the string "immortal" since they don't support searching in base64 encoded data. CapLoader, on the other hand, supports lots of encodings. Having all these encodings also makes it possible to search network traffic for words like хакер, القراصنة, ハッカー, 黑客 or 해커. 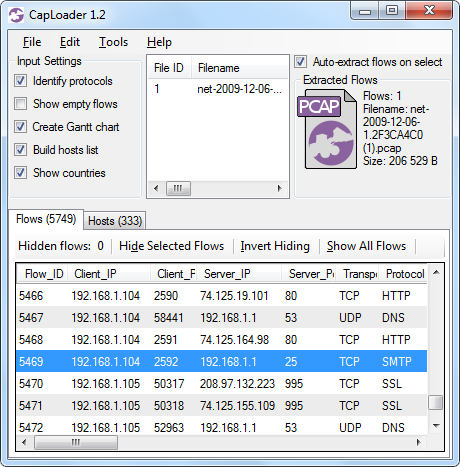 CapLoader is a commercial tool that also comes in a free trial edition. The search feature is available in both versions, so feel free to download CapLoader and try it your self!